Michael Daniel Ho - The Wildlife Ho-tographer: A new Canon EF 800mm f/5.6L IS II ? The PhotoPlus Expo starts this week in New York City on October 24. Canon has been very tight-lipped on their announcement. 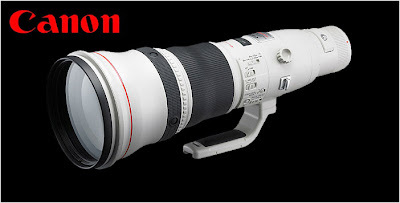 Although it has been rumored Canon is waiting to announce a few more new lenses, like the EF 200-400mm f/4L IS + 1.4X, the EF 100-400mm f/4-5.6L IS II and the EF 400mm f/5.6L IS, word is they are not too happy with recent leaks, like the purported EOS-3D camera in development with the megapixel sensor. There has been 'sightings' of experimental Canon megapixel cameras out in the field popping up in Asia and Europe. Some are rumored to have 50 MP sensors. We should see, at the very least, the announcement of the development of a super megapixel camera later this year or early 2013. The photographers Canon picked to test their equipment are bound by non-disclosure agreements. When they expire, we will get more rumors and leaks coming soon. Also rumored is the EF 800mm f/5.6L IS lens may be in for a remake. The recent release of the Series II super telephoto lenses is a big hit, especially with the weight reduction. Canon may be trying to take advantage of this lighter weight technology and come out with a Series II model of their 800mm lens, currently the heavy weight champion, coming in at 10 pounds. I am off to the Canadian tundra this morning on a Wildlife photo shoot. Bringing my EOS-1D X to test it out in very cold weather and try and photograph Polar bears and the Aurora Borealis. The camera is working out well for me, especially now that it has the newest Firmware 1.1.1 update. Canon USA has finally released a new Firmware update to the EOS-1D X to address the 'flaws' photographers like myself have been clamoring for. Read my review of this excellent camera. The official Canon download is available here. Will try and stay in touch if I can find WiFi signals.